What a huge bummer for Alex Thomson and Team Hugo Boss. In a “shakedown” of sorts – and a rather aggressive one, at that – Thomson and his co-skipper for the 2 man Transat Jacques Vabre Race, Guillermo Altadill, started the 5400 mile Transat Jacque Vabres race from Le Havre, France to Itajai, Brazil on Sunday the 25th of October. On October 31, a scary day indeed for the 2 sailors, they set off their EPIRB requiring a rescue from their brand new, sinking IMOCA 60 monohull, Hugo Boss. The entire fleet who set off from France on the 5,400 mile double-handed race to Itajai, Brazil, confronted seriously damaging winds and huge seas and many of the boats were forced to retire from the race. Thomson and Altadill had turned Hugo Boss around to head back to Spain to look into repairs needed to repair “structural issues” to the new boat, and in the 36 hours heading back to shore, the boat continued to break and it became obvious that it was starting to sink forcing the rescue some 82 miles off the coast of Spain. Once the 2 men arrived safely back on land, the team began the effort to recover the damaged boat and tow it safely back to make further repairs in hopes to get the boat in shape to race in Alex’s goal: the Vendee Globe which starts on 6 November, 2016. Plenty of time, we would hope, to get the boat in proper ocean going shape for a round-the-world adventure. Thomson hopes to become the first non-French skipper to win the Vendee Globe, a crazy solo, non-stop race around the world. Check out the rescue video from the Spanish Coast Guard. They must have been very busy with all the retired boats off the coast of Spain. It is great news that Thomson’s boat has been recovered and is alongside in A Coruna, Spain. The Fastnet Race Starts Today! The Rolex Fastnet Race 2015 will start for the first class – the multihulls – at midday today, Sunday 16th August. The course is unchanging; 603 miles along the south coast of England to Lizard Point, and then turning north-west into the Irish Sea and heading for the Fastnet Rock off the southern tip of Ireland. Once around, it’s south-east back to the Isles of Scilly, before turning back east to the finish in Plymouth. Of the entry list of 400 boats, many raced across the Atlantic from Newport in the Transat and stuck around to compete in the Fastnet Race, like the speed machine, Comanche and the storied race course classic, Dorade. Dorade has won the legendary 603-mile race twice before: in 1931 and again in 1933 and part of her mission with these big ocean races is to again capture the silver at the finish line. After the start full coverage of the Rolex Fastnet Race will continue with pictures and video on the multimedia page, the latest news and the Competitors’ Blog to keep race fans up to date. All of the yachts in the Rolex Fastnet Race will have YB Trackers so the worldwide audience can track their progress in real time – 24 hours a day. Sunday is the start of the second iteration of this particular Transatlantic Race (First one was in 2011) and the line up of yachts at all 3 of the starts is sure to be a sight. 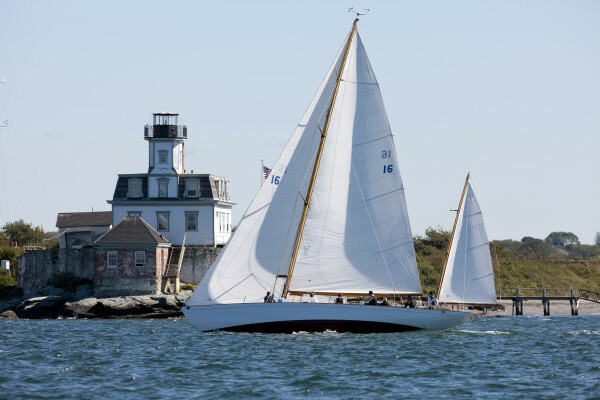 The race starts at Castle Hill in Newport and stretches some 2,975 miles to the Lizard in England. Historically, there have been many Transatlantic races since the very first one in 1866, with massive schooners taking part, placing wagers for winning and setting records. The Schooner ‘Atlantic’, seen in the painting below, built of steel in 1903 with no hydraulics and just ten crew, set the record for the transatlantic crossing at 12 days, 4 hours and 1 minute. A mono-hull record that would stand for 100 years. Since The Great Race in 1866, there have been 27 transatlantic races. In 2011, Rambler 100 (Video above) set a new with an elapsed time of 6d 22h 08m 2s. (Rambler went on to compete in the Fastnet Race in 2011 where she lost her keel and miraculously everyone survived).